One Bedroom Suite steps from the beach! Stunning lakeviews and steps from the beach! 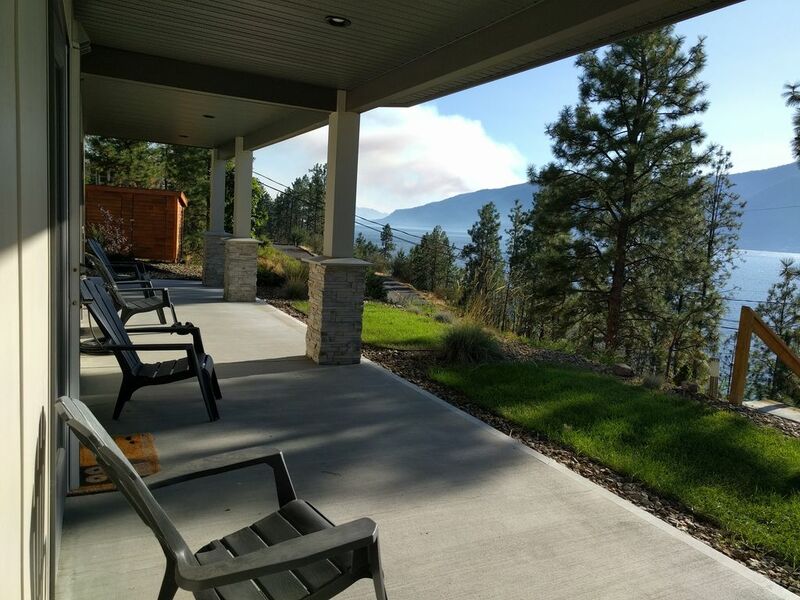 Semi-lakeshore property in a quiet, natural setting overlooking Okanagan Lake. Guests have a 1 bedroom private suite on ground level with separate entrance. Minutes from renowned local wineries. 10 mins from Kelowna airport. Close to hiking, biking and running trails. A short drive to coffee shops, restaurants, and grocery stores. Big White and Silver Star ski resorts are only an hour drive. This suite is situated in our walk-out basement with a private entrance. There is one bedroom with full en-suite bathroom and a full kitchen with living space in the suite. There is access to a washer and dryer - they are shared with another suite via a hallway and your suite can be locked off from the hallway. The lake and beach are literally steps away, across a quiet road. Bring your water toys or kayaks or take some chairs down and relax at the beach. The private outdoor living space has a patio set and BBQ for guests to use. We will be here for your check-in and to welcome you. We live upstairs and are available anytime for assistance but in general it's important to us to give you the privacy you desire. Lake Country is home to award-winning Okanagan wines, year-round camping and hiking, destination ski and golf resorts, and acclaimed fine and casual dining. Unless your time in Lake Country is being spent relaxing at the beach we recommend having a car to explore the surrounding areas. Please note that the TV in the living room does not have cable, but there is high-speed wireless internet so bring your own device if you like! Pets (cats and small dogs) are welcome for a fee of $20/pet/night. We are a small quiet family with one infant and do our best to keep noise to a minimum but as we live upstairs you may notice normal household noise throughout the day. 1) One Bedroom steps from the beach! 2) Two bedroom suite steps from the beach! We had a lovely four-day stay. Colin and Bianca were wonderful hosts making us feel right at home. The suite had everything we needed and we enjoyed the opportunity to sit on the patio during breakfast and supper. Lake was a short walk down the hill yet easy to get to and so peaceful. It is rocky so shoes are needed. We would highly recommend this place if you want some R&R. We stayed 2 nights in this lovely 1 bedroom and full kitchen. Colin was very good at answering my questions and switching me from the smaller studio with kitchenette. We decided we wanted a full kitchen. We also had our small dog with us and she loved the lake across the street. The unit is very clean and seems quite new. It had everything we needed. We did find the walls thin and could hear noises/voices from the studio unit. We also had to pass the studio unit to walk out. Also, the beach at the lake is quite rocky and its steep to walk down, but the lake is very nice. The closest town is 10-15 minute drive away. I highly recommend getting groceries before checking in if you plan to cook. There was a BBQ but we didn't use it. It's hard to find a pet-friendly place, so we loved it and liked that the owners didn't micro manage us with pet rules, they just assume we're responsible dog owners! I hope to be back at Colin's place next summer. Very clean modern and comfortable apartment. Loved watching the eagles fish in the lake. We had a wonderful few days staying with Colin and Bianca in their home overlooking Okanagan Lake. Located in quiet Lake Country, roughly half-way between Kelowna and Vernon, with numerous wineries nearby, the house is a two-minute walk from the lake. The one bedroom apartment has a large patio (with BBQ), a full kitchen, and terrific views of the lake. It is a perfect location for exploring the region, and we will definitely return. Highly recommended. We were very pleased with the accommodations and amenities provided by Colin & Bianca. The one-bedroom suite is completely seld contained and very sound proof. Although a family lives upstairs and other guests were staying in the studio suite, we did not hear any noise. The neighbourhood is very quiet and peaceful and the suite has a spectacular view of Lake Okanagan. We would highly recommend this location for visitors who want to be close to the lake. For skiers, the location provides a commutable one-hour drive to Big White.